F/A-18C Fighter Jet breaking the sound barrier at 750 MPH. Credit: Ensign John Gay, USS Constellation, US Navy. Explanation: Many people have heard a sonic boom, but few have seen one. When an airplane travels at a speed faster than sound, density waves of sound emitted by the plane cannot precede the plane, and so accumulate in a cone behind the plane. When this shock wave passes, a listener hears all at once the sound emitted over a longer period as a sonic boom. As a plane accelerates to just break the sound barrier, however, an unusual cloud might form. The origin of this cloud is still debated. A leading theory is that a drop in air pressure at the plane described by the Prandtl-Glauert Singularity occurs so that moist air condenses there to form water droplets. 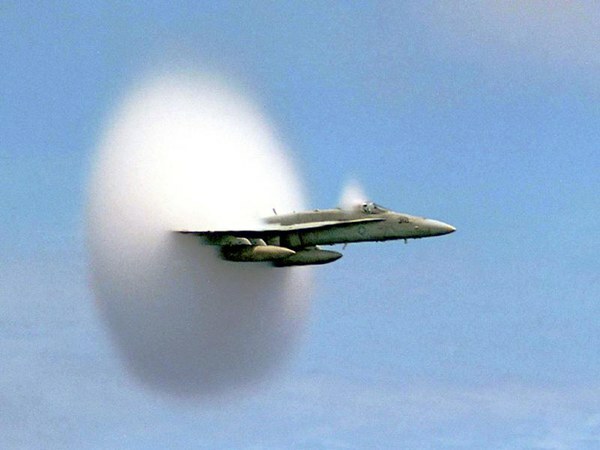 Above, a Boeing F/A-18 Hornet was photographed just as it broke the sound barrier. Large meteors and the space shuttle frequently produce audible sonic booms before they are slowed below sound speed by the Earth's atmosphere. Source: www.nasa.gov. Would you like to sponsor a Featured Image? Please inquire for details. Please contact us if you have any questions or need additional information. Thank you for your consideration. Celebrating 33 years as a Colorado Corporation serving clients around the world. Providing forensic services since 2004. Copyright �1986-2019 Automated Dispatch Systems, LLC. All rights reserved. No portion of this website may be copied without written consent from Automated Dispatch Systems, LLC.